When prospects ask why we chose to build our MaxQ solutions on the Acumatica platform, we cite Acumatica’s modern cloud-based design, integrated architecture, rich feature set, user-friendly interface, comprehensive mobile support, and advanced automation capabilities. All these capabilities and more were highlighted at the recent Acumatica Partner Summit, including enhancements made in 2018 that made the Acumatica ERP an even stronger platform. Improvements slated for 2019 promise to make the Acumatica platform even stronger still. 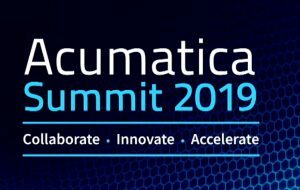 Acumatica has been recognized by IDC, Nucleus Research, Gartner, PC Magazine, and others for its dedication to creating a user-friendly experience, and this year’s Summit showed an ongoing commitment to making the system easy to use. Several improvements centered on the Acumatica Generic Inquiries tool, which is used to extract data for reporting and analyses. In the new version, Acumatica is making it easy for non-coders to make queries. Importing data into Acumatica also is being made easier. The results of Generic Inquiries, for example, can be used to import data from Excel spreadsheets and other import scenarios. Page customization also has been made easier for non-coders. A new feature, called Custom Conditions, allows non-coders to add new business rules to existing pages. Another new feature enables you to personalize an Acumatica instance using colors—for example, to differentiate between different company sites and branches. A new feature called conditional highlighting, added to queries, uses color again to make it easy to identify information, such as high performing and low performing records. 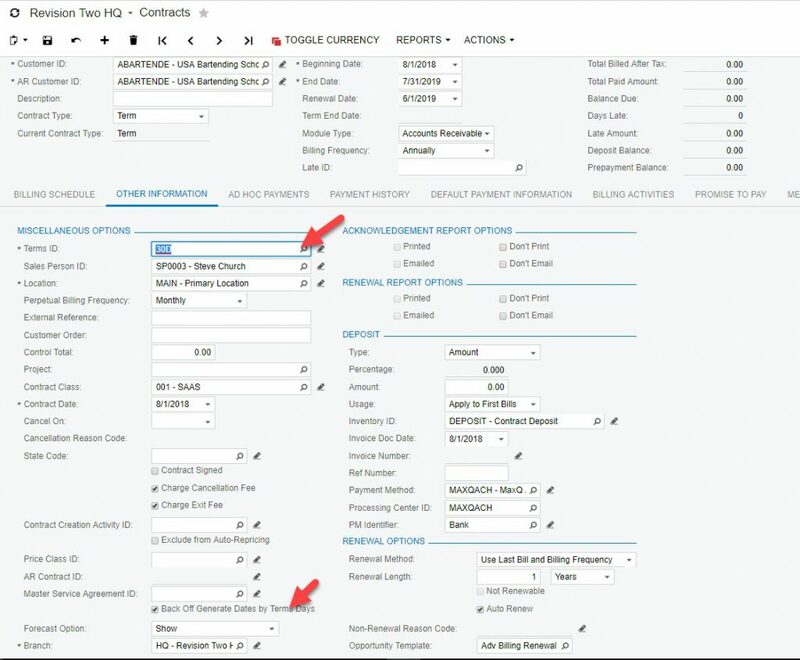 Another new ease-of-use feature is the Side Panel, a panel at the right side of your form, which enables you to see information, eliminating the need to navigate between records or open multiple browser windows. For example, using side panels you can see inventory item details while querying a sales order line without having to drill down to the inventory item. Other new ease-of-use features include a processing bar that enables you to monitor the status of long-running processes as they run in the background. Acumatica also is making application development easier using its Business Query Language (BQL). Creating a complex BQL query has been difficult in many cases, so Acumatica is creating a new technology called Fluent BQL that makes it dramatically easier to write and read queries. A new integration between Acumatica BQL and Microsoft LINQ also has been created to make querying easier and more expansive. The ability to easily extract information from an Outlook email is another improvement. Incorporating AI and machine learning into the Acumatica platform is a big priority going forward. Among the processes that are being enhanced by AI are customer help queries and the automation of accounting processes such as expense report coding. For example, a user will be able to simply swipe a picture of a receipt and the data will automatically be entered into the system. The Summit audience saw a natural language search demo using Acumatica’s new Alexa for Business, using voice commands used to look up inventory, opportunities, and contacts, as well as to approve expense claims. Another demo showed Google Cloud Vision Product Search being used to look up common items. In this case, a smartphone camera was able to locate a pair of shoes. This type of search could be useful in manufacturing and field service scenarios, such as searching for the right ingredient, component, or replacement part. Surveys show that comprehensive and flexible reporting is a top priority for customers, so Acumatica is taking steps to enhance its already strong reporting tools and dashboards, including adding more prebuilt reports to the platform. A new document data dictionary also has been added. A new multi-factor authentication security feature has been added that requires a code to be entered by a user to be allowed to log in. The code can be sent in different formats to mobile devices and a fingerprint scan can be used to gain entry as well as typing in the code. As Acumatica CEO Roskill explained, the next phase beyond the cloud is connectedness, so the focus in 2019 is on advanced integration across the entire business, including better integration of accounting and inventory. The aim is to connect partners, suppliers, customers, and business units, while creating exceptional customer experiences at the same time. Acumatica has received numerous honors and recognition from industry analysts and product reviewers. At this year’s Summit, Acumatica CEO Roskill shared the news that Acumatica had just received PC Magazine’s Editor’s Choice for Best ERP for the third year in a row. Acumatica also won the SIIA Codie Award, the Oscar of the software industry, for best cloud ERP solution and best manufacturing solution. Acumatica earned the top ranking in ERP usability from Nucleus Research for the third year in a row, as well as the highest customer satisfaction rating from Gartner in the Gartner Magic Quadrant for Cloud Core Financial Management Suites for Midsize, Large and Global Enterprises. Gartner accurately recognized Acumatica as “visionary” in its first magic quadrant evaluation of cloud-based ERP vendors. Acumatica has been executing on its vision at a high level to create what many analysts deem to be the leading ERP platform. As Acumatica CEO Jon Roskill noted, Acumatica put up some impressive growth numbers in 2018. Acumatica now has 5,200 customers, 1,200 of whom joined in 2018. Acumatica systems worldwide performed more than 160 million ERP transactions per month, which totaled more than 1 billion transactions in 2018. Acumatica had 103 million logons in 2018, with 99.999% uptime and 97% support satisfaction. Acumatica’s focus on customer success has resulted in Acumatica’s continued reign as the fastest growing cloud ERP vendor. The revenue goal for 2019 is 88% growth, which would enable Acumatica to maintain that lead. As Jon Roskill noted, Acumatica does not have a sales force, relying rather on VARs and ISVs as the channel through which it sells its products. This channel is also growing rapidly, with 47 new VAR partners joining the Acumatica ecosystem in 2018. Because Acumatica does not have to pay a sales force, it can devote more resources to R&D. As a result, said Roskill, Acumatica has more developer resources devoted to ERP development than any of its competitor, including Microsoft, SAP, and Oracle. Development will continue to focus on enhancing the core modules and the usability of the software, including the ability to cross modules and send information from one area of the business to another, such as intercompany financials and payment processing. Lowering the cost of migration of data is another aim. Independent software vendors like MaxQ are able to extend the Acumatica platform to provide advanced solutions for particular applications and industries like recurring revenue management, inventory management, and cannabis management. This year, we were pleased to see Acumatica incorporate the MaxQ Advanced Billing solution into the Acumatica platform. We also were pleased to see MaxQ CEO John Pavain among the 30 partners who received Acumatica’s Most Valuable Professional award. The usability, integration, data manipulation, AI, reporting, and other enhancements that are strengthening the Acumatica ERP, coupled with the enhancements MaxQ has built into our Acumatica solutions, makes a MaxQ Acumatica solution an unbeatable value proposition for our customers. We encourage you to check out the latest MaxQ Acumatica solutions to see what we mean. MaxQ is a provider of advanced Acumatica business solutions across a wide range of applications and industries. Contact us to learn more about how MaxQ for Acumatica solutions can help your business. 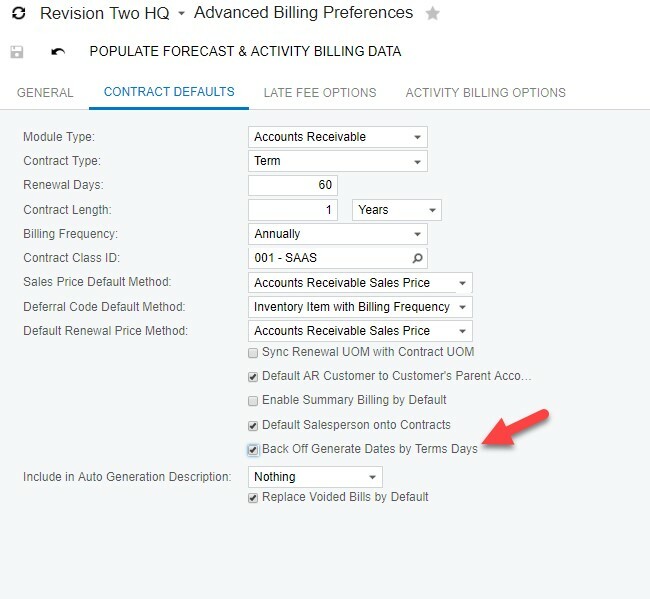 In the upcoming Release 18 of Advanced Billing for Acumatica, we added a requested feature for calculating a “generate date” based on the contract terms. 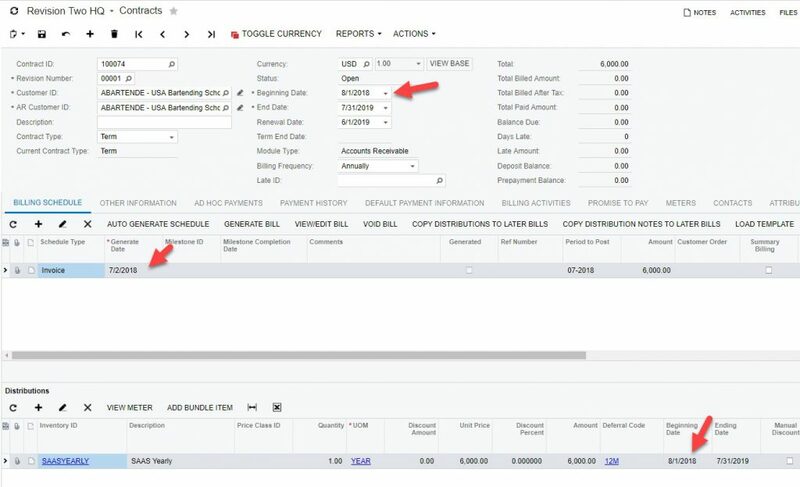 If you have contract invoice terms of 30 days, meaning the bill is due 30 days after the invoice date, and you want to have the due date entered as the date of the generated invoice, the Advanced Billing system will calculate the date for you. First, enter a contract and set the terms to 30 Days. Make sure “Back Off Generation Date by Term Date” is checked. 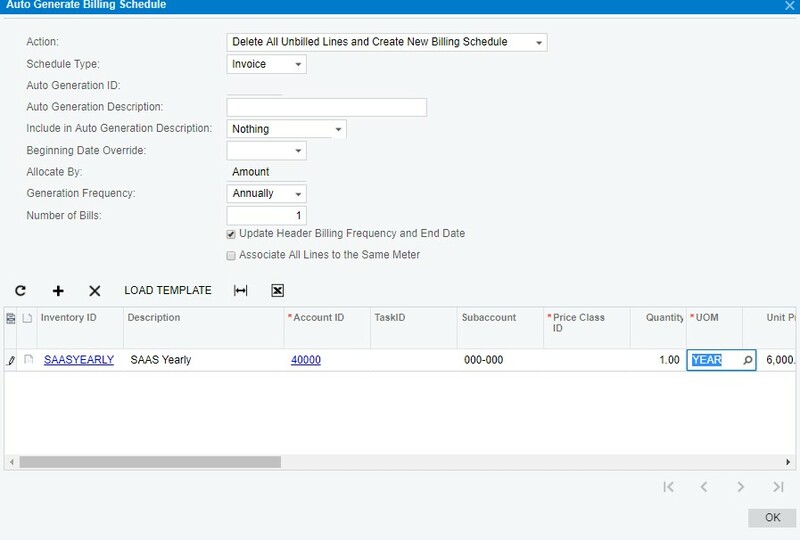 Next, Auto Generate Billing Schedule. Contract schedules are created with the correctly calculated dates. Notice the beginning date of the contract and distribution period is still 8/1/2018, but the generation date has been recalculated to be 7/2/2018, so the due date of the invoice will be 8/1/2018. MaxQ is a provider of advanced Acumatica business solutions across a wide range of applications and industries. Contact us to learn more about how MaxQ for Acumatica solutions can help your business.